Find a Mirror Man for hire near you in minutes! Option 1. Enter your event location below & contact a Mirror Man directly! Option 2. Request multiple quotes from available Mirror Man Get Quotes! Option 3. Read information & advice on hiring Mirror Man Read Advice! WANT TO KNOW MORE ABOUT Mirror Man Acts? Read on for the most comprehensive guide to booking a Mirror Man Act, including how much a Mirror Man Act costs, exactly what they will do at your event, plus tips, advice and information to help make your event one to remember! What exactly will a Mirror Man Act do at your event? The Mirror Man Act is exactly what you would expect it to be; A human statue, absolutely covered it little squares of mirror! This fantastic visual has proved to be consistently captivating for audiences and will suit any event! From a work party, a charity event, a conference, or as fate or festival entertainment, the Mirror Man Act comes highly recommend from us! The Mirror Man Act is an iconic look within the world of street entertainment and can alter their look to suit your event. The standard Mirror Man look is a top hat, suit, glasses, and walking stick, all covered in nothing but shards of mirror! The performer will turn up at your event and change into their costume. Once transformed into the Mirror Man, they can then work as a wonderful mix and mingle performer, stopping for photos along the way! One of the many captivating aspects of any human statue is the slight moments of deliberate movements! A Mirror Man will be no different and will be a master of comedy timing! The defining nature of mirror is its reflectiveness and therefore a Mirror Man will work wonderfully as indoor entertainment where any bright/colourful lights are, the Mirror Suit will naturally change colour! What an eye-catching image! Mainly, a Mirror Man Act will entertain your audience with a fantastic performance that will put the wow factor into celebrations and impress your guests, whatever their entertainment tastes may be. What event types are Mirror Man Acts hired for? How about hiring a Mirror Man for your wedding drinks reception? The hired Mirror Man will dazzle with a performance that can be performed inside or outside (weather permitting!) The Mirror Man will prepare themselves in a private room at your wedding drinks reception venue where they can then appear and impress your friends and family with an act that is classic, funny and also artistic. The hired Mirror Man Act will put on a display like you would see from a street entertainer, making crowd participation a big part of their act! This is therefore be a wonderful ice-breaker for family and friends who may have not have met before! The Mirror Man will make great photo opportunities as well, so your guests will have a moment to really remember your wedding by! The wedding evening drinks will be a fantastic time to hire a Mirror Man and a Mirror Lady to perform! Whether your wedding music entertainment is a wedding band or a wedding DJ, the Mirror performers can be set on stage where they will put on a sparkling show along side the music! The Mirror Entertainers will give your wedding guests a focus when on the dance-floor. You can either request that the Mirror Performers dance to music whilst on the wedding venue stage, or you can hire Mirror Men and Mirror Women to dance to music as mix and mingle acts! Mirror Acts may also offer a show where they will dance to mirror based songs such as ‘Man in the Mirror’ by Michael Jackson, ‘Mirror in the Bathroom’ by The Beat, ‘Mirrors’ by Justin Timberlake and ‘Mirror’ by Lil Wayne ft. Bruno Mars, amongst many others! Hire a Mirror Man for a work party and you will be blown away by the skills on offer! A Mirror Man Act can offer a number of different services such as a mix and mingle entertainer, a human statue or a dance act, dancing on the stage at your work party! 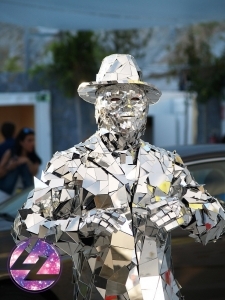 The Mirror Man will work as a shimmering ice-breaker, whatever type of Mirror performance you decide to hire. The Mirror Man or Mirror Woman will offer the same great services for a work Summer party, a work Christmas party, a colleague’s leaving party, a work conference or a charity/fundraising event. How about hiring a Mirror Man to entertain the crowds at a trade show or product launch?! The experienced street entertainer will brighten up your event and will be skilled in how to keep your audience interested! The Mirror Man/Mirror Woman can parade as a human statue, or they can perform as a silent street entertainment act where they will involve the crowd in a variety of shenanaggans! This will no doubt be a great boost for your product, whatever industry you are in. How about hiring a Mirror Man or Mirror Woman to dance the night away at your club night?! The Mirror Performer is an incredibly watchable act and will lead the dance floor in dance routines to each song played! As well as being a fantastic dance-podium act and club stage act, the Mirror Man will also be a brilliant walk-around performer who will be able to boogie on down with the customers, again, making for a fun and intriguing act to have your photo taken with! Searching for acts that are unique for your party this year? How about hiring a Mirror Man to shimmer at your party?! If it’s a birthday party, then this act will be a splendid focus for all of your guests and will be a totally original performance that’ll work as an icebreaker for guests who have never previously met. 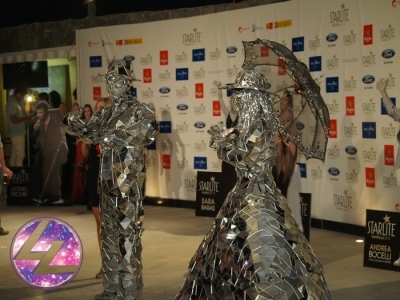 How about hiring a Mirror Man or Mirror Woman to wow the party goers at an anniversary party? Or a garden party? Whatever the party is, the Mirror Act will shine! You may be hosting a Disco themed party? As a Mirror Man Act can be hired as a professional dance act, we would advise to hire a Mirror Man Performer to dance their mirrored socks off at your disco themed event! How much do Mirror Man Acts cost to hire? Our simple to use entertainment directory allows you to firstly search for the best Mirror Man Acts who are local (or travel to your area) and then via the contact form you may contact them directly to enquire for a no obligation quote to perform at your event. Some acts will also add a rough price guide to their profile for your convenience. What are the usual set formats and performance lengths for Mirror Man Acts? A Mirror Man Act can be very versatile when it comes to timescales at your event/function, wedding or party. The average time of a Mirror Man Act’s show will be about 45 minutes to 60 minutes. Each Mirror Man Act's perfromance times will change however. The easiest way to enquire about this is by using our simple-to-use messaging service here on the Entertainersworldwide.com website. How much space will a Mirror Man Act need at your event? This depends on the type of show the Mirror Man Act offers. The Mirror Man Act will need a minimum of a 6ft diameter. The best way to find out exactly is to message the Mirror Man Act and find out what space they will need prior to the event. What equipment and set up requirements do Mirror Man Acts need? Most Mirror Man Acts will be self-sufficient and won’t need any set up requirements. If the venue is large, they may require a PA, a microphone and professional lighting to perform at their best. We suggest that you message the Mirror Man Act using the messaging service on our site to find out what they need exactly. It is standard practice for a Mirror Man Act to require a room where they can get changed and change clothing in private. Please check ahead with your venue to see if they a) have a backstage area, or b) a spare room in which the Mirror Man Act can set-up. How can you find and book a Mirror Man Act with Entertainersworldwide.com? WANT TO RECEIVE A RANGE OF QUOTES FROM Mirror Man?